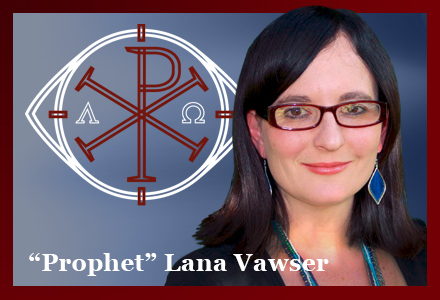 Lana Vawser is part of the notorious Elijah List and the Australian Prophetic Network. For some reason, she thinks God spoke to her through the Disney song from Aladdin, “A Whole New World.” This is pure straight jacket material. What makes this straight jacket material worse is that it was recignised and endorsed by Charisma Magazine. Yes – someone actually wrote this. Yes. Charisma Magazine actually published this. This is NOT satire or parody. This is a tragedy because people BELIEVE IT. Recently the song “A Whole New World” from the children’s movie Aladdin played over and over in my head all morning long. I went and looked up the lyrics and felt the Lord saying that this is a word for many who are leaning in and waiting for new doors to open. I felt the Lord saying that many who are waiting and contending for open doors are now meeting and about to meet doors of destiny that are going to open a whole new world up before them. Everything is going to look different but in the most glorious way. All the opposition, all the confusion, all the haze is going to fade away as the people of God move through these doors. As they “come up higher” with the Lord to a place of crystal-clear insight and clarity (Jer. 33:3). Things of this season and the tremendous opposition will suddenly make sense. It’s a new level of freedom; it’s a new level of soaring. The Lord is taking His people on new adventures, and these adventures will be so exciting. The Lord is going to share His heart and treasures, and there will be such much more to see in this release than the people of God have ever seen. The expectation and excitement in the spirit is going to a whole new level. Walking through these new doors of destiny, the Lord is going to show you how far He has brought you. You may have been stretched almost to the point of feeling like you were going to die, but you are going to accelerate once you step through these doors in a way you haven’t experienced before. Where you have been pressed, you are coming forth as a beautiful diamond shining His glory in many different facets. In these new “destiny doors,” you are moving into a deeper place of seeing He is the greatest diamond of all—the greatest treasure. You will begin to see new facets of His glory, His nature and promises in these encounters with Him in these new realms. His Word is going to come alive to you like never before in this season. Oceans of encounters await in the red letters of Jesus’ words. Huge levels of revelation and an aligning of focus back to Jesus away from distraction and false beliefs is happening in deeper ways in this season. An aligning back to and deeper into focus on Jesus and His Word is happening right now that is breaking off holds of the enemy, containment, limitations, distractions, doubt and fear. As these destiny doors are set and open before you, a greater yes will be required from you to the Lord, a new level of surrender and trust that hasn’t been explored before, but a heavenly resolve and conviction is coming upon the people of God to move forward in the pursuit of seeing heaven come to earth and a determination that, despite the cost and despite the sacrifice, “I cannot go back.” Onward and upward from here! As these destiny doors open, I saw many people looking at them in awe, but fear was trying to keep them from moving forward because the doors are bigger than they realized and require a greater sacrifice. Do not let fear steal the door that’s before you. You are moving into a whole new world in Him! He is going to speak to you in greater, more creative ways, He is going to make His confirmations loud, and you will be comforted by His presence is with you in the “new.” His voice of love and the revelation of His perfect love are going to wash away the fear as you take this new ride with Him. There is a new horizon before you, people of God! Keep standing in Him; keep close to Him, with your ear to His chest. A whole new world is going to open up for you through these doors of destiny, and it’s only going to get better from here. There are many wide-eyed gasps of awe coming over the people of God as they watch Him far exceed their dreams and expectations (Eph. 3:20). There are many glorious surprises along the way! Get ready to see Him like you have never seen Him before. Fun adventures and joy are before the people of God, a whole new level of dreaming with and in Him. In seeing Him, all else around is going to become crystal clear. We are stepping deeper into the revelation of being “seated in heavenly places with Him” (Eph. 2:6). It’s your time to shine! “A new fantastic point of view” is upon you! Lana Vawser has a heart to encourage the body of Christ and individuals in their walks with Jesus, to have deeper intimacy with Him and to learn to hear His voice. She operates in the prophetic and loves to share the heart of God with others. Lana has written her first book, titled Desperately Deep—Developing Deep Devotion and Dialogue with Jesus, and loves to see others grow in all that God has for them. For a limited time, we are extending our celebration of the 40th anniversary of Charisma. As a special offer, you can get 40 issues of Charisma magazine for only $40! NEW – Life in the Spirit is your Spirit-filled teaching guide. Encounter the Holy Spirit, hear God speak to you, and enjoy timeless teachings on love, mercy and forgiveness.LEARN MORE! This is where “the slippery slopes” of heresy lead. “Aladdin” and his lady friend look more like Kong He and Sun Ho, don’t they? False prophets – they all look the same to me…. 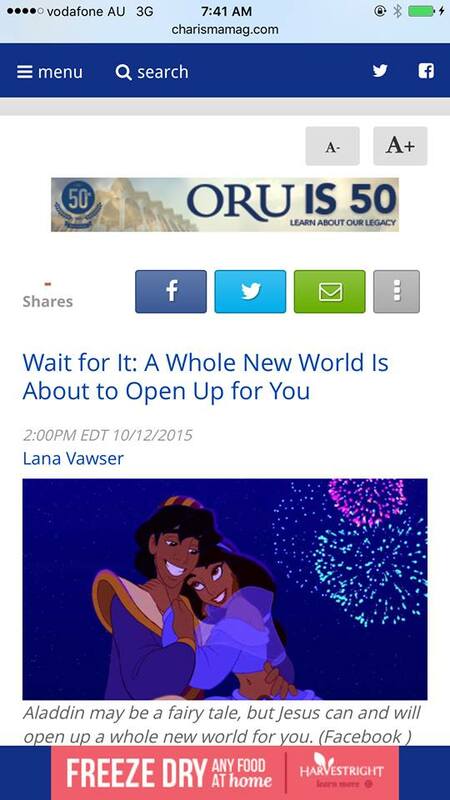 Isn’t Disney part of the illuminati? We don’t get involved in conspiracy theories on our sites, Annette. Sorry, I didn’t realise it was a conspiracy theory. Just one of many these days. Certainly distracts from the gospel message. She put it out over the APC FB page, but I found a workaround so I could view it and copy it. The arrogance of that lady is astounding. These nar people are nothing less than attention whores. We have been watching Vawsers public responses closely. She has responded and we are reviewing her now. All of these nar false ‘prophecies’ are always generalized mystic stupidity. isaiah 7:14 Therefore the Lord himself will give you[a] a sign: The virgin[b] will conceive and give birth to a son, and[c] will call him Immanuel. zechariah 11:12-13 I told them, “If you think it best, give me my pay; but if not, keep it.” So they paid me thirty pieces of silver. And the Lord said to me, “Throw it to the potter”—the handsome price at which they valued me! So I took the thirty pieces of silver and threw them to the potter at the house of the Lord. Nar people don’t do that, they just make up stupid garbage. To further destroy nar credibility they make up garbage that is proven outright wrong, as that farcical anointing of Todd Bentley, which was a complete failure and outright lie. >>>> How do these near false prophets get away with these false prophecies year after year? Read and heed all you false prophets…. hebrews 12:6 For the Lord disciplines the one He loves, and He chastises everyone He receives as a son. hebrews 12:8 If you are not disciplined–and everyone undergoes discipline–then you are not legitimate, not true sons and daughters at all. Spot on Bones. I also noticed two things yesterday, Churchwatcher. One is the fact that both Amanda Wells AND Lana Vawser were removed from the APC’s advertising banner on the GCC’s website just before the ‘summit’, so it appears that there may have been a strategy already in play to lessen any impact of Wells’ verbal and written sins/crimes. One would be the ‘accused’, and the other one would play the role of being her ‘public defender’, and also distance themselves from pastor Kaitlin and the rest of the “prophets” whose images remained on the banner advertising. More pontificating garbage for the gullible lol. One must ask how can born again believers continuously fall for this kind of crap. Hey, where is Amanda’s husband isnt it Roger wells? Is this another case like Beth Moores: Wheres the missing husband? How come Roger-I’m-Supposed-To-Be-Her-Cover isnt on here speaking too? This very verse was preached often in Brisbane during the early 1990’s – by LRM proponents! Yes, they were preaching that the staid old denominational churches would become bone dry and devoid of any preaching or teaching worth having. I know, because I sat in their meetings for more than a year, listening to that theme. A lot of those LRM people are dead and gone, never having realised their dream of Dominionist and Reconatructionist theology coming to pass. Of the few that are left, most are disillusioned with the virtual non event that Latter Rain teaching on end times has become. What a money-making racket. No wonder they have to keep pumping out prophecies…. At $1702 for a balcony room, lets make sure all those prophecies sound nice and sweet to investors ears! Video comparing himself to isaiah, then elisha, then photos of Fire angels…. WHAT??? The farther you get into nar, the more it gets weirder and weirder, What a deception! matthew 24:24 For false Christs and false prophets will arise and will show great signs and wonders, so as to mislead, if possible, even the elect. I’d avoid any cruises where clocks might start running out of control like in a horror movie. Hi Bones – I’d forgotten all about these ‘holy’ cruises. First mooted by pastor Kaitlin during mid 2012, I remember overhearing a conversation between her and two of her admin staff, as these ‘cruises’ were just an idea back then. One of the admin ladies pointed out that “price could be a consideration for some families”, but Kate’s response was basically “well if they can’t afford it, then maybe they shouldn’t be there…” and that was that! No pensioner discounts (so the older folks might die before they ‘heard from God’) and no discounts for students or low income earners either. People tend to relax and let their guard down while holidaying, and this would have been the main purpose of these holy cruises. Hi Apollo, i wonder how much of a ‘love offering’ they squeeze out of each ‘heavenly cruise’ (in addition to that cruise price)…. Offerings could be significant, and maybe these ‘holy word givers’ each has their own idea of an expected or even guaranteed generous stipend…. Wolves usually isolate the sheep so they can devour them, so what better disarming ‘backdrop’ to use, than the peaceful Islands of the South Pacific for such a strategy to take full effect? Ten days away from home at a nearly $2,000 price tag, plus some onshore adventures to build up the cameradery… purrrfect!